Home Housekeeping Here’s what happens if you put soap on the mirror! It’s impressive! Here’s what happens if you put soap on the mirror! It’s impressive! Because the bathroom mirror fogs frequently, it gets on streaks and lime scale. But if it is cleaned often and with appropriate products, the mirror should shine cleanliness. Cloudy mirror is often irritating. When in the bathroom is much warmth and humidity that you can’t see yourself, once you wipe the mirror the image remains unclear for a long time. If you are unfamiliar with this unpleasant situation, apply this trick! It acts immediately and the bathroom mirror will no longer fog and will stay clean for a long time. 1. All you need is a piece of hard soap, the most common one. Draw some lines or squares all over the mirror. 3. Lines of soap must be wiped then with a soft cloth. Carefully wipe all traces until they disappear completely. 4. 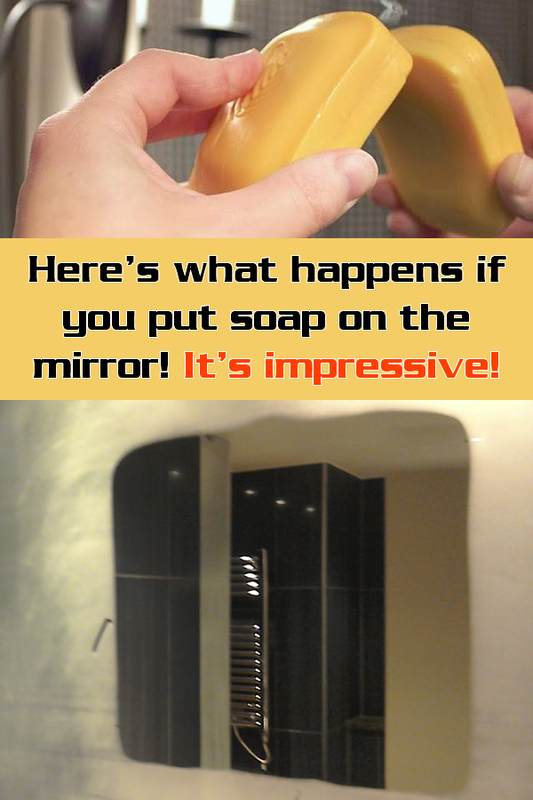 As a result you will get a shiny, clean mirror. With this idea it will sweat longer! 5. Also soap will prevent sweat glasses lens on winter! Just apply a little hard soap on them and wipe it with a cloth. It is impeccable! 6. Even the diving mask can be protected by the same method! Note that the best solution against glass clouding is just in your home! From now on it will have clean and clear reflection, so do not forget to smile more often by looking into it. To get rid of lime scales from your mirror confidently use a solution of white vinegar and water. Spray daily over the entire surface of the mirror and allow it to work for a few minutes. Then remove excess liquid with paper or filter paper. They are so fine that absorbs all the moisture and does not scratch the glass surface. Next articlePut some dye on your hair brush and do this! It’s brilliant!